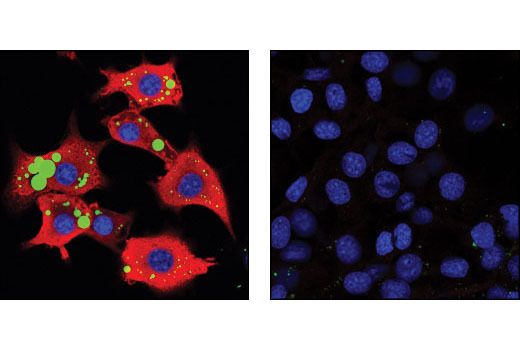 FABP4 (D25B3) XP® Rabbit mAb detects endogenous levels of total FABP4 protein. 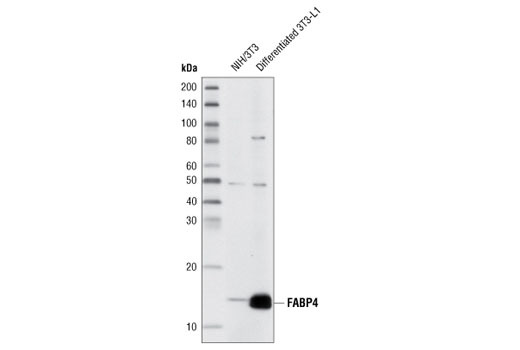 This antibody may cross react with other FABP family members. Monoclonal antibody is produced by immunizing animals with a synthetic peptide corresponding to the sequence of human FABP4. Fatty acid binding proteins (FABPs) bind to fatty acids and other lipids to function as cytoplasmic lipid chaperones (1). They participate in the transport of fatty acids and other lipids to various cellular pathways (2). The predominant fatty acid binding protein found in adipocytes is FABP4, also called adipocyte fatty acid binding protein or aP2. FABP4 is also expressed in macrophages (3). FABP4 knockout mice fed a high-fat and high-calorie diet become obese but develop neither insulin resistance nor diabetes, suggesting that this protein might be a link between obesity and insulin resistance and diabetes (4). Mice deficient in both FABP4 and ApoE show protection against atherosclerosis when compared with mice deficient only in ApoE (3). Mice carrying a FABP4 genetic variant exhibit both reduced FABP4 expression and a reduced potential for developing type 2 diabetes and coronary heart disease. A related study in humans indicated a similar pattern, suggesting that FABP4 may be a potential therapeutic target in the treatment of these disorders (1). Makowski, L. et al. (2001) Nat. Med. 7, 699-705. Hotamisligil, G.S. et al. (1996) Science 274, 1377-1379.